The Scoop: Audrey Hope has been a healing voice for singles and couples for over 20 years. Her work as a relationship expert, addiction therapist, spiritual counselor, and life coach has made an indelible impact. She possesses an intuitive understanding of emotional issues and excels at giving people simple solutions to their problems. Anyone can ask her a quick question online and receive a personalized email response, but she also offers private coaching sessions for those who want to dive deeper into personal matters. By sharing her soulful guidance through a variety of mediums, Audrey brings hope to people everywhere. In July 2014, Natascha S. suffered a miscarriage 16 weeks into her pregnancy, and she fell into despair. A close friend saw her struggling to deal with this tragic event and recommended seeing Audrey Hope, a spiritual life and relationship coach with a private practice in Brentwood, California. Audrey Hope’s relationship expertise has brought healing and hope to many singles and couples. Over the last 20 years, Audrey has worked with many people facing emotional struggles and spiritual crises. She founded Ask Aubrey Now, a private coaching practice, to support individuals, like Natascha, through trying times. As the name of her practice suggests, Audrey encourages her clients to ask her questions about any emotional, spiritual, or mental issues. Anyone can submit a question online (for a $25 service fee), and Aubrey will reply via email. This is great for someone who wants a quick fix to life’s daily challenges. Of course, people with more in-depth issues may not be satisfied with a one-time answer, so Audrey offers 30-minute and 60-minute coaching sessions over the phone. While she specializes in addiction therapy, she can also speak with authority about relationship issues and spiritual challenges. Audrey’s multi-faceted approach to coaching has allowed her to come to the assistance of people from all walks of life, and she’s known for her ability to get to the heart of just about any personal issue. Audrey has been in the business of healing others for over 20 years. She began as an addiction therapist in Malibu (aka a Healer to the Stars), but she soon wanted to expand her influence as a relationship and life coach. She started her private coaching practice in 2010 and now counsels men and women toward happier and healthier ways of life. 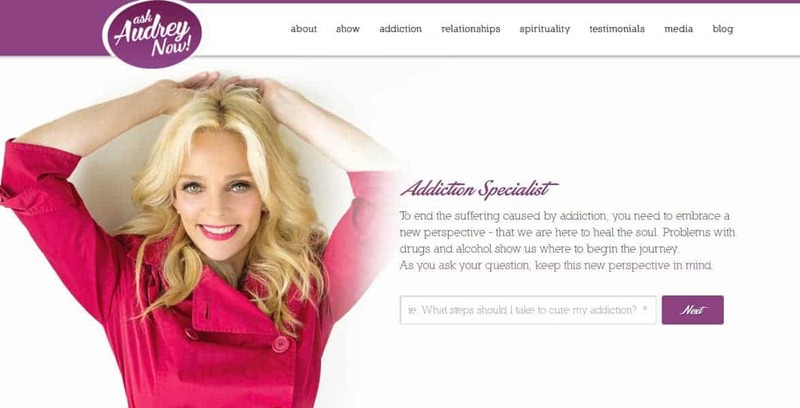 Throughout her career, Audrey has helped many high-profile clients cope with addiction problems and relationship issues. Her client list includes many CEOs, doctors, producers, lawyers, athletes, authors, heirs, and celebrities. Audrey Hope gives soulful dating and relationship advice online and in person. Audrey has set herself the task of healing the world, so she promotes her inspirational words of wisdom through every media outlet available to her. Her advice has been featured by Reader’s Digest, Bustle.com, The Huffington Post, and Glamour, among others. Recently, Audrey has expanded her online coaching efforts in hopes of reaching a more global audience. She now shares her insights on love, relationships, and life through her YouTube channel, which she calls Hope for Relationships. Every week, Audrey posts a video full of relationship and life advice for people of all ages and backgrounds. She chooses topics based on the questions she receives from her audience, so she could be talking about the necessity of sleep one week and the challenges of heartbreak the next. Using a thoughtful tone, the esteemed life coach discusses practical strategies to achieve good mental health and to improve one’s quality of life. Billing herself as the “ultimate problem solver” and the “healer to the stars,” Audrey sets high expectations for viewers of her YouTube channel — and her soulful advice delivers the goods. Audrey endeavors to connect with her clients on a deep spiritual level, and, if her testimonials are any indication, she’s often successful. Many coaching clients have written testimonials expressing admiration for the way she intuitively understood what they were feeling and experiencing. “Audrey’s unique insight and undying patience have been paramount to my journey of self-discovery,” said Joe L. in a five-star review. “That’s really what Audrey is all about, helping you discover yourself. Spreading hope is a full-time job for Audrey. She works hard to lift people up in private coaching sessions and discuss their issues from a problem-solving perspective. Clients dealing with a range of personal problems — from substance abuse to heartbreak — seek Audrey’s help and find solace thanks to her sage advice. Potential clients can get a feel for Audrey’s coaching style in her blog posts, media interviews, and YouTube videos. If they like what they hear, they send Audrey a question online or book a personal consultation. This simple system makes Audrey’s guidance accessible to anyone experiencing trying circumstances, so nothing stands between them and the help they need.